Welcome to the Kentra Grain Systems Web Site. 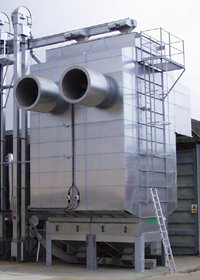 Kentra manufactures a range of high temperature continuous mixed flow grain dryers with drying capacities from 6 - 60 tonnes per hour. We hope that you find something of interest and we would be pleased to see your comments and suggestions. Please don’t forget if you have any questions about our products please send us a message from the ‘Contact us..’ page and check the ‘What’s New?’ page for new pages and amendments.